The sweet and spicy scents of vanilla and cinnamon are already filling the air and the recurrent warmth of the kitchen oven in many Maltese homes should be enough signs that Christmas is fast approaching. 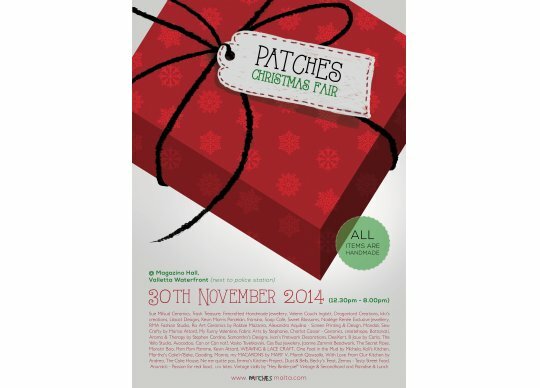 But what would Christmas be without the Patches Christmas Fair? After a successful summer fair, the Patches team have yet again carefully selected 60 talented makers, old and new, to set-up their colourful and heart-warming stalls jam-packed with ceramics, jewellery, textiles, food and more great ideas that make ideal gifts for this special season. The chosen participants are: Sue Mifsud Ceramics, Trash Treasure, Firecrafted Handmade Jewellery, Valerie Cauchi Inglott, Dragonlord Creations, kiki’s creations, Lilacat Designs, Kevin Morris Porcelain, fransina, Soap Cafe, Sweet Blossoms, Nadège Renée Exclusive Jewellery, RMA Fashion Studio, Ro Art Ceramics by Robbie Mazzaro, Alexandra Aquilina – Screen Printing & Design, Mandali, Sew Crafty by Marisa Attard, My Funny Valentine, Fabric Arts by Stephanie, Charlot Cassar – Ceramics, createhope, Bottonati, Aroma & Therapy by Stephen Cordina, Samantha’s Designs, Ivan’s Fretwork Decorations, DeeXart, B Joux by Carla, The Yello Studio, Avocadoo, Can or Can not?, Vasko Tsvetkovski, Ces Buz Jewelery, Joanne Zammit Beadwork, The Secret Rose, Monstri Boo, Pom Pom Pomme, Kevin Attard, WEAVING & LACE CRAFT and One Foot in the Mud by Michela. For all lovers of vintage: “Hey Birdie-pie!” Vintage & Secondhand and Paradise & Lunch will be setting up their stalls, too. Kali’s Kitchen, Martha’s Cake’n’Bake, Gooding, Manna, my MACARONS by MARY V, Misrah Qawsalla, With Love From Our Kitchen by Andrea, The Cake House, Ne me quitte pas, Emma’s Kitchen Project, Dust & Bells, Becky’s Treat, Zemos – Tasty Street Food, Anurakti – Passion for real food and i.n.i bites will cosy up the atmosphere and satiate your hunger with a medley of traditional and seasonal, healthy or diet-breaking, gluten-free and raw treats, which will surely take visitors across the four corners of the world.